Definition at line 22 of file StringParam.h. 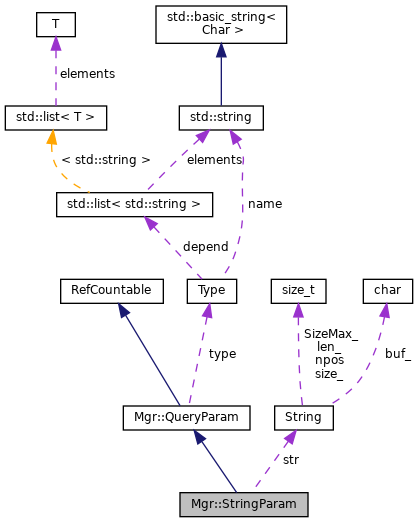 Definition at line 15 of file StringParam.cc. Definition at line 20 of file StringParam.cc. Definition at line 26 of file StringParam.cc. References Ipc::TypedMsgHdr::putPod(), Ipc::TypedMsgHdr::putString(), str, and Mgr::QueryParam::type. Definition at line 33 of file StringParam.cc. Definition at line 39 of file StringParam.cc. Definition at line 32 of file StringParam.h. Referenced by pack(), unpackValue(), and value(). Referenced by Mgr::Inquirer::applyQueryParams(), pack(), and Mgr::IntParam::pack().